I stumbled upon this years ago and it is now a summertime favorite ‘go-to’ salad for me. 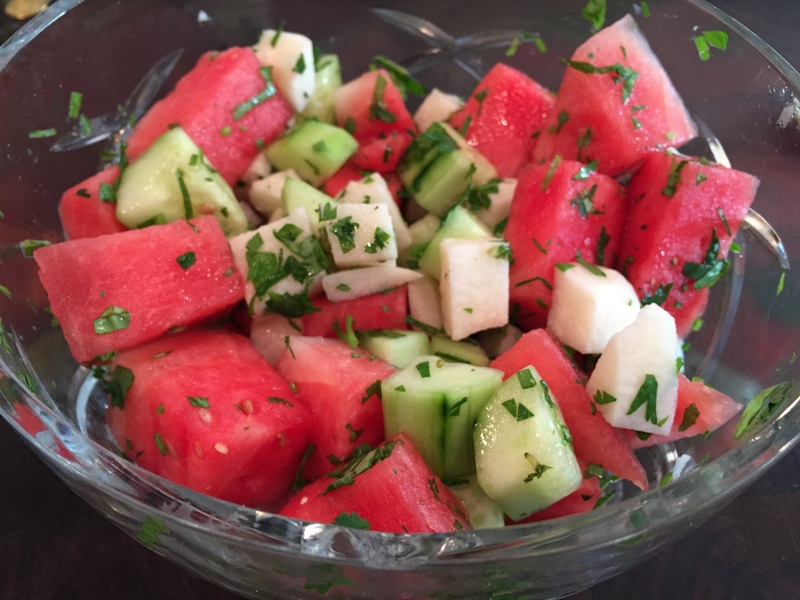 The combination may see odd, but trust me, the flavors merry perfectly together and as long as your watermelon is ripe and flavorful, this will not disappoint. It takes advantage of summertime produce, and it’s beautiful to boot. Then generously squeeze fresh lime juice over the top and mix well. . I am not including measurements because you can make as much or as little as you want. As you can see in my photo, I like mine full of herbs. But you can use less if you want. This is the beauty of this salad. Its so customizable. Make as much, or as little as you like. This salad travels perfectly in a cooler for a picnic or poolside, and is beautiful on a buffet table. Try it and leave me your feedback! It is, oh, so hot here right now. Minnesota, land of extremes. Given it is ‘freeze the snot in your nose’ cold in the winter, and winter lasts for what seems like FOREVER, you’d think I’d have nothing to complain about when summer finally rolls around. But, being the bi-polar state it is, if it’s not -20 and so dry your skin turns to shoe leather, it is blistering hot, humid and buggy. We get a smattering of lovely days, but it’s not till fall that the bugs die off (vicious, biting, carry your baby off, nasty bugs) and it becomes a ‘pleasant’ place to be. By then, the days are short and the nights longer. I can’t bear to think ahead to that LONG, COLD winter, so instead I’ll muddle through this heat, taking advantage of the locally grown produce, and make a refreshing salad. This one is a twist on a traditional Caprese Salad. Enjoy! Whisk the oil & vinegar together, add the garlic, season to taste. Chiffonade (slice in to thin ribbons) the mint and basil, and add to the dressing. Pour over thick sliced tomatoes, sprinkle with goat cheese. Enjoy as a light lunch or as a side with grilled meat for dinner. Heck, this is so good, I’d eat it for breakfast…and I have!